View More In Handheld Pool Vacuums. 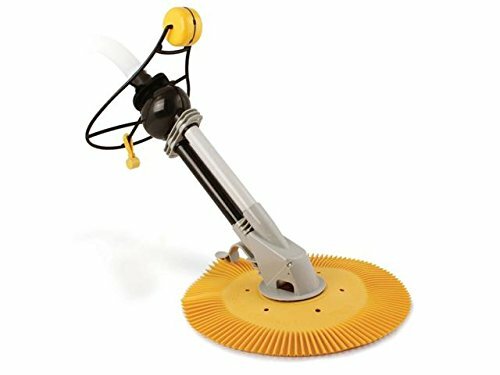 Derby Automatic Pool Vacuum Powered by the existing filtration system, the Derby Vac connects easily to the wall skimmer to thoroughly clean the bottom and sides of steel wall above ground pools! The Derby automatically removes dirt, debris, bugs, twigs, leaves and even pebbles effectively and quickly when the filtration system is on, and the pressure valve allows you to adjust the water flow to the cleaner to guarantee peak performance. Designed with only one moving part to ensure a long life, sit back and relax as you enjoy your crystal clear pool with the automatic assistance of the Derby cleaner. Requires a 1/2 HP pump or a minimum flow of 1300 GPH to operate. The ideal cleaning solution for steel wall above ground pool types from leading pool manufacturers.